•	Load ranges from 50kg up to 220kg per wheel. 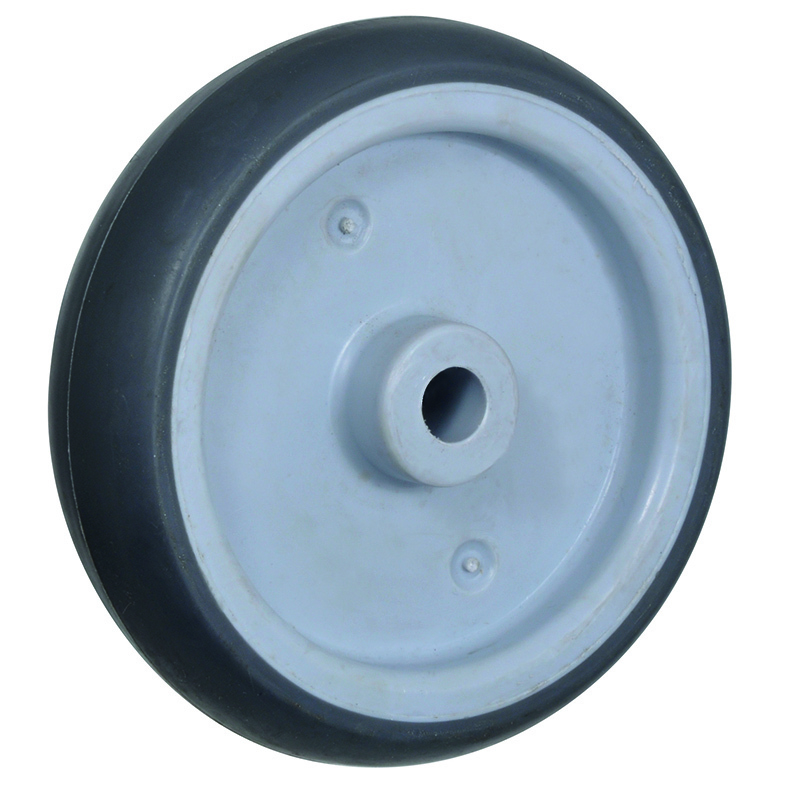 Grey vulcanised rubber on polypropylene wheel with plain bore. Wheel diameter 50mm, tread width 18mm, Hub width 21mm, Bore size 8mm. Load capacity 40kg. Grey rubber on polypropylene wheel with plain bore. Wheel diameter 50mm, tread width 18mm, Hub width 21mm, Bore size 8mm. Load capacity 25kg. please note as from 1.4.2011 now supplied with out axle material..
Grey thermoplastic rubber on polypropylene wheel with plain bore. Wheel diameter 60mm, tread width 22mm, Hub width 29mm, Bore size 10mm. Load capacity 45kg. Grey thermoplastic rubber on polypropylene wheel with plain bore. Wheel diameter 50mm, tread width 24mm, Hub width 28mm, Bore size 8mm. Load capacity 50kg. Grey thermoplastic rubber on polypropylene wheel with plain bore. Wheel diameter 75mm, tread width 24mm, Hub width 29mm, Bore size 10mm. Load capacity 50kg. Grey thermoplastic rubber on polypropylene wheel with plain bore. Wheel diameter 75mm, tread width 24mm, Hub width 29mm, Bore size 8mm. Load capacity 50kg. Grey rubber on polypropylene wheel with plain bore. Wheel diameter 75mm, tread width 21mm, Hub width 27mm, Bore size 10mm. Load capacity 70kg. Grey rubber tyre on black polypropylene centre with a plain bearing. Wheel diameter 80mm, Tread width 25mm, bore size 12mm, hub length 40mm, load capacity 50kg. Grey rubber on polypropylene wheel with plain bore. Wheel diameter 60mm, tread width 24mm, Hub width 28mm, Bore size 8mm. Load capacity 50kg. Grey rubber tyre on black polypropylene centre with a roller bearing. Wheel diameter 80mm, Tread width 25mm, bore size 12mm, hub length 40mm, load capacity 50kg. Grey thermoplastic rubber on polypropylene wheel with plain bore. Wheel diameter 75mm, tread width 32mm, Hub width 36mm, Bore size 10mm. Load capacity 70kg. Grey rubber tyre on black polypropylene centre with a plain bearing. Wheel diameter 100mm, Tread width 30mm, bore size 12mm, hub length 40mm, load capacity 70kg. Grey thermoplastic rubber on polypropylene wheel with ball bearing bore. Wheel diameter 50mm, tread width 24mm, Hub width 28mm, Bore size 8mm. Load capacity 50kg. 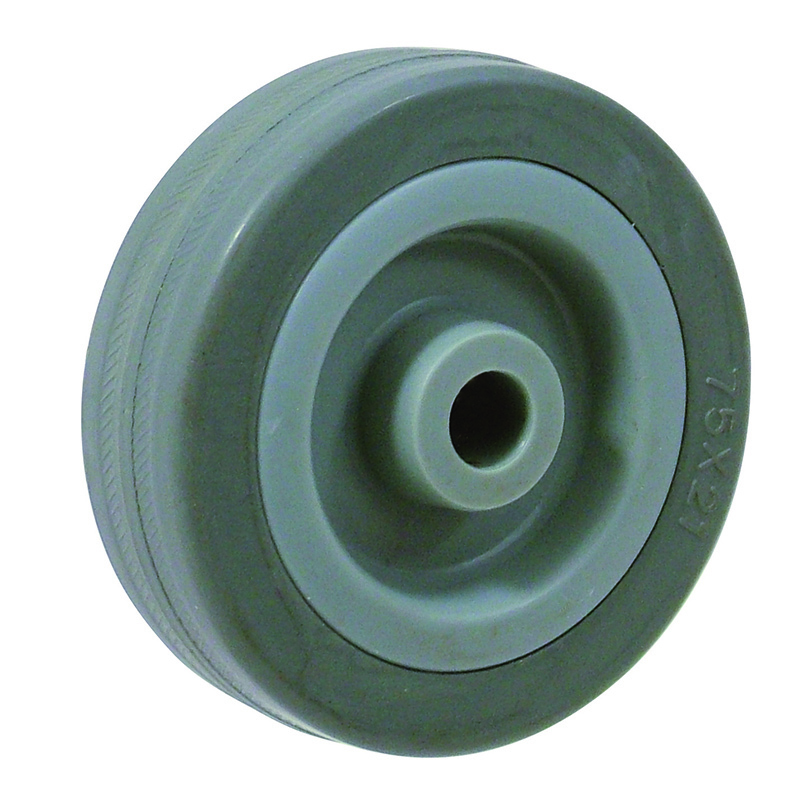 Grey thermoplastic rubber on polypropylene wheel with plain bore. Wheel diameter 80mm, tread width 30mm, Hub width 34mm, Bore size 12mm. Load capacity 70kg. Grey thermoplastic rubber on polypropylene wheel with plain bore. Wheel diameter 100mm, tread width 30mm, Hub width 35mm, Bore size 12mm. Load capacity 80kg. Grey rubber tyre on black polypropylene centre with a roller bearing. Wheel diameter 100mm, Tread width 30mm, bore size 12mm, hub length 40mm, load capacity 70kg. Grey thermoplastic rubber on polypropylene wheel with plain bore. Wheel diameter 125mm, tread width 24mm, Hub width 28mm, Bore size 8mm. Load capacity 80kg. Grey thermoplastic rubber on polypropylene wheel with ball bearing. Wheel diameter 50mm, tread width 18mm, Hub width 21mm, Bore size 6mm. Load capacity 40kg. Grey thermoplastic rubber on grey polypropylene wheel. Wheel diameter 80mm, tread width 28mm, Hub width 40mm, Bore size 12mm. Load capacity 60kg. 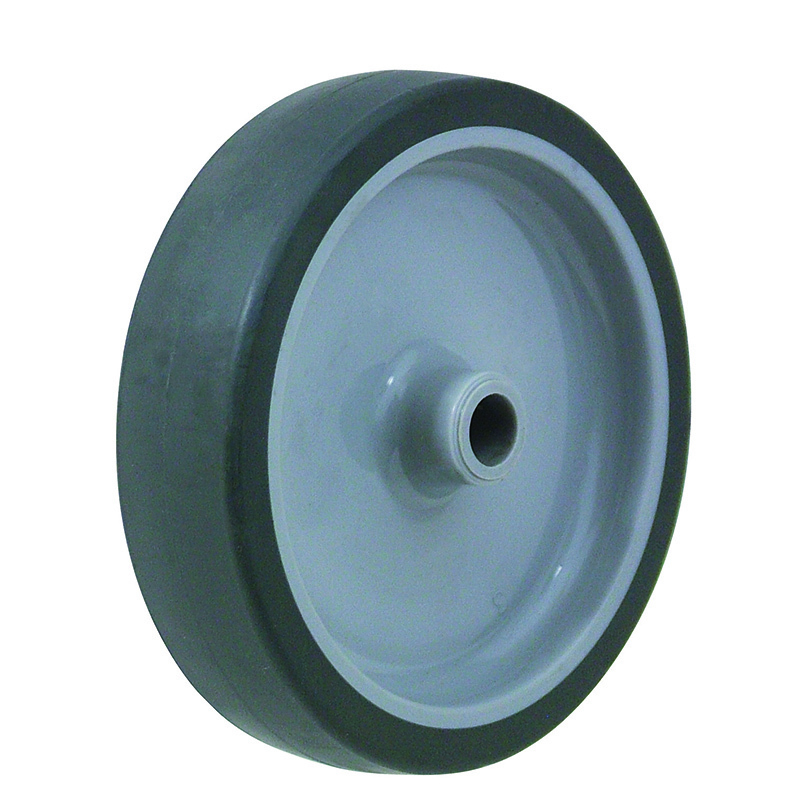 Grey thermoplastic rubber on polypropylene wheel with plain bore. Wheel diameter 125mm, tread width 30mm, Hub width 35mm, Bore size 12mm. Load capacity 100kg.